When solids are reduced to the nanometer scale, they exibit new and exciting behaviours which constitute the basis for a new generation of electronic devices. Nanotechnology for Microelectronics and Optoelectronics outlines in detail the fundamental solid-state physics concepts that explain the new properties of matter caused by this reduction of solids to the nanometer scale. 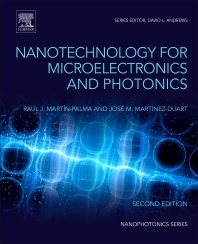 Applications of these electronic properties is also explored, helping students and researchers to appreciate the current status and future potential of nanotechnology as applied to the electronics industry.